Would you like to prepare Chemmeen Theeyal Recipe? 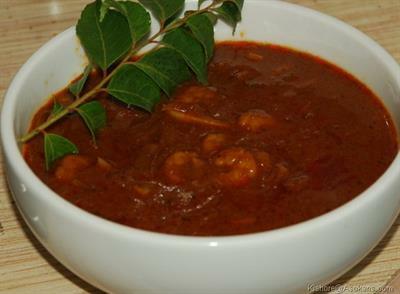 Chemmeen Theeyal Recipe is one of the famous receipe in Kerala as well as other state. Read here about Ingredients and Method to prepare of Chemmeen Theeyal Recipe which has good taste and healthy vitamins. 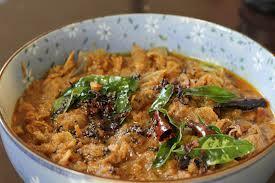 The Chemmeen Theeyal is available in Kerala cuisine and it is most popular among Malayalees . It is easy to prepare and it consumes less time only with simple ingredients. This will be more delicious to serve and to eat and please it read the recipe before proceeding with it. It takes a preparation time of about 10 minutes and cooking time of about 30 min in addition to this it has some nutritional factors like carbohydrates, dietary,calcium etc. It is most likely by all type of peoples especially malayalees. Let us see the ingredients and making of Chemmeen Theeyal. STEP 1: Wash the prawns completely and keep it aside when necessary take it. STEP 2: Chop Ginger, shallots, garlic and tomato well. STEP 3: Heat the coconut oil of 1 table spoon in cooking pan and put grated coconut, ginger, garlic, half of the chopped shallots and curry leaves. With all the combinations stir it well in a medium flame to avoid raw smell of ingredients. STEP 4: On stirring it becomes brown at that stage turn the flame to low. Put chili and coriander leaves and stir again for more 2 minutes. Now remove the pan from flame keep it cool for some moments. STEP 5: Grind the roasted coconut in a mixer grinder without adding a water and make it to a fine paste. STEP 6: Now dissolve tamarind with 3 cups of water. Remove the seeds and any pieces which are not dissolved in it and dissolve it again. STEP 7: Cook Prawns for about 10 minutes in a covered vessel along with tamarind dissolved water, turmeric powder, tomato and salt during boiling process turns off the flame. STEP 8: After it got done, add the ground paste and combine it well put salt for taste and boil it for 1 minute and remove the pan from flame. STEP 9: Now heat 1 table spoon of coconut oil which is added in all the foods of Malaya lees and put mustard seeds. Add shallots and curry leaves and add those to prepared prawn theeyal, and now chemmeen theeyal is ready for serving. Please try this recipe for ones and it tends to cook again and again. •	If Tamarind is not available please use kukum star or raw mango as alternatives.